While petroleum based fuels seem continue to be the major source for military mobility fleet, the gradual introduction of new materials, alternative fuels, and more efficient technology to improve energy usage, reduce energy dependency and go green is gaining a momentum and popularity. For example, in many talks it is also mentioned that use of alternative fuels will reduce the GHG but this issue misses a point. Two years ago the EPA gave the DoD a “national security exemption” (licence to pollute) that allowed it to use trucks that did not meet emissions standards for commercial trucks. The Defense Department wants Humvees (military's nickname for the High-Mobility Multipurpose Wheeled Vehicle, or HMMWV). The vehicle, an icon of the military for about two decades since it replaced the World War II-era Jeep, gets as few as 4 miles per gallon in city driving and 8 miles per gallon on the highway. A standard Humvee gets eight miles per gallon driving on hard surface roads at convoy speeds, a hybrid vehicle would get up to 16 miles per gallon. Army leaders have been designing a gas-electric hybrid Humvee that can travel nearly 470 miles on a 25-gallon tank-or about 19 miles per gallon-and then drive another 25 miles in silence using battery power alone. In comparison, Ford's Model T got 25 miles per gallon, and today a Ford Explorer gets 18 miles per gallon. 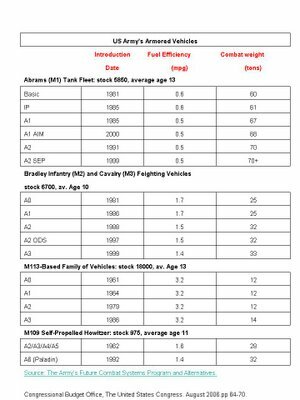 Armored vehicles have very lousy fuel efficiency. Over the past 45 years they haven’t registered any improvement. Instead they put on weight and became fuel drinking monsters. Below is the proof. The US Air Force is the largest oil consumer in US military. Aviation fuel consumption in 2005 was 2.5 billion gallons. Note that this is the same amount of fuel the US Airplanes consumed during WWII (between December 1941 and August 1945). Military runs on oil. Environment and fuel efficiency are and will always be less important than safety and power. What will become increasingly very important is the oil logistics. That was the case in the great wars, Vietnam and Gulf war. Now in Iraq and Afghanistan and tomorrow who knows where. For example, in Vietnam the US army consumed almost 190 million barrels of oil between 1964 and 1970. This makes almost 74000 barrels per day. In order to deliver 100 gallons to a troop unit, more than 100 gallons had to be delivered by tanker to care for normal handling and evaporation losses, enemy caused losses, and pilferage. According to a Rand Corporation report “1.88 billion gallons of fuel were consumed within the U.S. Central Command’s area of responsibility during Operations Desert Shield and Desert Storm (ODS/S), between August 10, 1990 and May 31, 1991.” This makes 44.8 million barrels, or 150 000 barrels a day. Note that ODS/S lasted 295 days. And now according to my estimates, the US military consumes roughly double than that only in overseas bases. J.P. Stucker, J.F. Schank and B. Dombey-Moore, Assessment of DoD Fuel Standardisation Policies, Rand Corporation, 1994. This figure is in line with Defense Logistic Agency: “During ODS/S DESC arranged fuel issues totaling more than 1890 million gallon,” (which makes 45 million barrels). Dimensions, Defense Logistic Agency, Spring/Summer 2002, p.27. According to Fuel Line in 2000 (Vol.2, p.15) During the Gulf War, DESC-ME was directly involved in fuel issues totaling more than 45 million barrels.